Our friends at Gizmodo caught wind of one of the classic Batmobiles from Tim Burton’s Batman movies is going on sale on eBay (what else). Coming in a just under 20 ft long, 8 ft wide, and about 3 inches off the ground, this bad boy might be more suited for showroom rather than driving the kids to soccer practice. 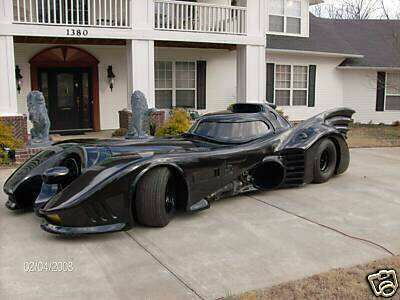 We looked this up on eBay, but were only able to find a bunch of Batmobile Hotwheels toys. I guess eBay realizes that our past transactions only qualifies us for the 99 cent childrens toys.